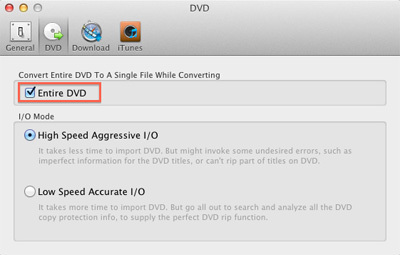 Before encoding a DVD, go to the menu bar, click Any Video Converter Ultimate (Pro) -> Preference -> DVD, there is an option "Entire DVD" which means "convert entire DVD to a single file while converting", the converted DVD will be in one file. Step 5: Choose the file, and click "Start" to download. You can also change the court of download tasks, by following Any Video Converter Ultimate (Pro) -> Preferences -> Download -> Tasks, the maximum court of download tasks is 5 at a time. b: Select the DVD disc under devices in navigation window and hit Open. For VIDEO_TS folder, just select the whole folder and hit Open. All titles/main movies will be listed in the main window. Click the Profile button down on the interface to select a default format. Or click the Profile Settings button on its artwork to customize profile by changing video size, video bitrate, video framerate, etc. Please click the "Convert Now" button. After the converting is complete, you can find the converted file listed in the corresponding library My File -> Video. PS: You can also read the Help to know more instructions of usages. Clicking Help -> Any Video Converter Ultimate (Pro) Help -> Video/DVD Converter, and please read the Load file and Profile settings. Before the conversion, Please set some configuration by clicking the "Profile Setting" button, there are 4 categories of parameters can be chosen: General, Video, Audio, and DVD. Please Select "DVD", click the "Audio Channel" to choose different languages with sound tracks; click "Subtitle" to select the subtitle language. There are two ways for the program to only convert a segment of a DVD. The first one is, before conversion, click the Profile Setting -> DVD -> Chapters, and then select the chapters you want. The second one is, before conversion, click Profile Setting -> General, there are "Start Time" and "Stop Time". Differ from the method one, this method 2 allows to customize time range beyond chapter's restriction. But one thing need to remember, after changing the time, please press "Return" on keyboard to make the area blue like the picture below shows. After adding a video, click the "Profile Setting" button, under General; you'll see Start Time and Stop Time, to clip videos through changing the time. But remember after changing the time; please select all the time in Stop Time box, or press "Return" on keyboard to make the area blue, like the screenshot above shows. To merge files, please drag one video and drop it onto the other one until a "+" icon appear, they will be merged into one file. To change the order of the files in the merged file, drag one video to the other until a blue-and-white line appears. To unmerge the file, drag the video out of the merged file until you see a blue line. Or just click the remove "x" icon. Then the videos will be split.